…but I have looked back. You don’t forget people who were kind to you, who encouraged, inspired, taught you to observe through a squint, or prism, or mist, who made the world new. Emilie Glen was one of those people. I met her in 1962, when we were both members of an off-broadway theatre company that performed children’s plays. I was studying at Juilliard prep then and had just started writing poetry. I had no idea who she was; nor was I told anything about her background. She was just a lovely adult in the cast, always friendly, always helpful. As often happened in those days, because my mother was curious about everyone, and the kind of person everyone liked, and also because behind my back, my mother was my greatest admirer, my mother and Emilie became good friends. When my mother found out that Emily was not only an accomplished actress and musician, but also a published poet, my mother asked if she would read some of my poetry. The result was that Emilie became my first literary guide and mentor. Unfortunately, a couple of years after I left the company, life’s progress and challenges shifted my interests, my mother’s attention, and we drifted apart, lost contact. 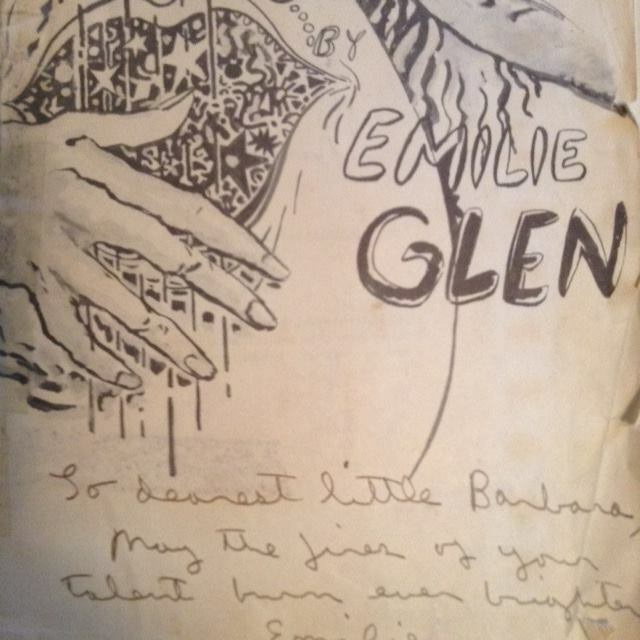 When I started writing poetry again, a couple of years ago, after almost twenty years away from it, the first person I thought of was Emilie. I searched for her, expecting to find her as celebrated as other poets of her generation, but saw she was not. More dismaying was the fact that she had passed away in 1995. How had I let her fade from my life? And then I quickly spotted Poets’ Press, and its publisher, Brett Rutherford, who had already published two volumes of her writing and was interested in publishing more. He had a list of chapbooks he had not been able to locate. One was “The Laughing Lute,” the chapbook she had given to me as a gift. I contacted him, sent him scans, and I’m delighted to say these wonderful poems are now in the third volume of her work, which was just released. I’m so pleased her work has a champion. Thank you Mr. Rutherford. And thank you, Emilie, for being “willing to take a little chance” on a little girl. Wow. This is such a touching story. Thanks for sharing. She sounds like a remarkable woman, judging by the bio link you posted. She would have been great to know. Also, how wonderful to have her take an interest in your writing! Thank you for sharing these memories with us. What a wonderful story, Barbara! I’m so sorry that when you went searching to reconnect with her that she had passed. But how incredible of you to play such a key role in her work being published for the rest of us to enjoy. Brava!